Travel & Tour industry is a fast forward ongoing business in today’s hectic world. Travelling is one of the important and fun part of an individual’s life. Everybody loves travelling and visiting new places in their country or outside. There are a numerous number of places in the world which are beyond our knowledge. For that, travel companies are being established to let people be aware of the most distinct and famous places worldwide. 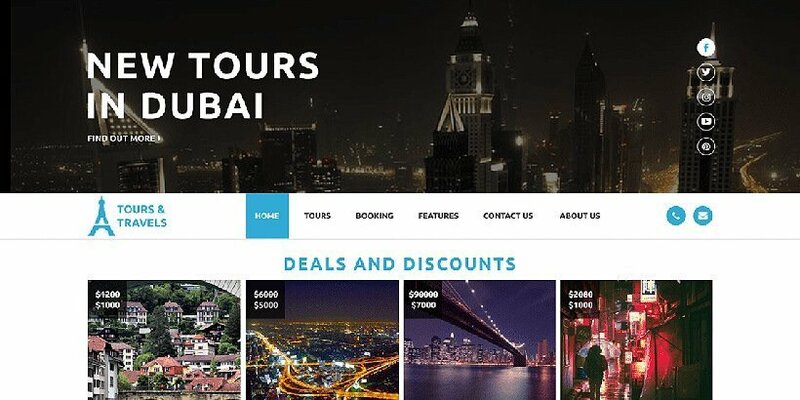 To let these travel companies show the globe what they have to offer we have prepared this article where we will discuss about free WordPress travel themes. As we know that there are lots of travel company growing rapidly and to run their business effectively in this competitive world it’s really a tough thing. But how can anyone know about such travel companies? Well, the internet is there for all. Yes, the internet plays a vital role in the growth of a business as it is known for sharing of news and information worldwide. Hence, a complete, impressive and professional website is what a travel company needs. That’s right an outstanding online presence of a company makes easy for them to be recognized in their business while also helps in extending it even further. Likewise, we have heard a lot about travel bloggers who frequently travel around different places in the world and they are always enthusiastic to share their journey and stories with others. The easiest way for them to share their experience is via a website. With a splendid website, they can easily describe their travel journey with everyone. And WordPress is what most of the people choose as the web platform for their website. 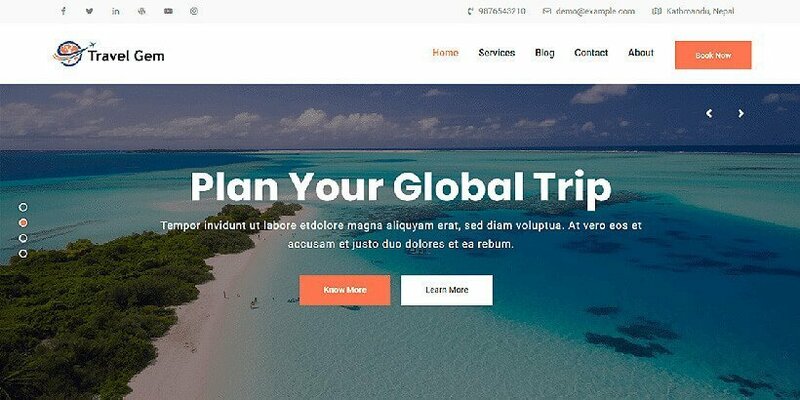 Best Free WordPress Travel Themes for 2019! 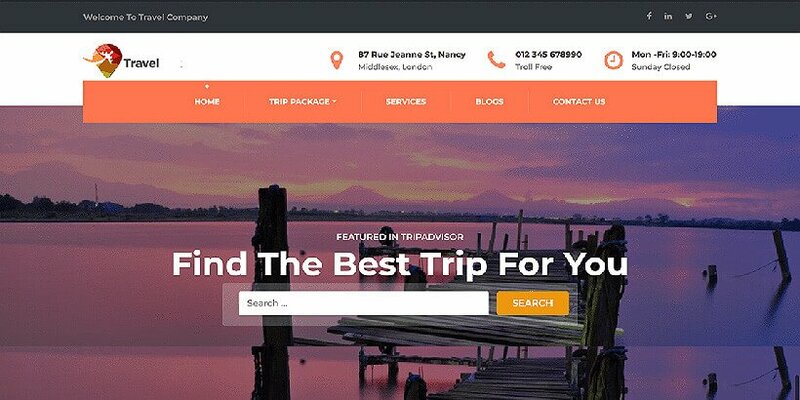 So, here we would like to present to you our unique and prominent collection of best free WordPress travel themes. 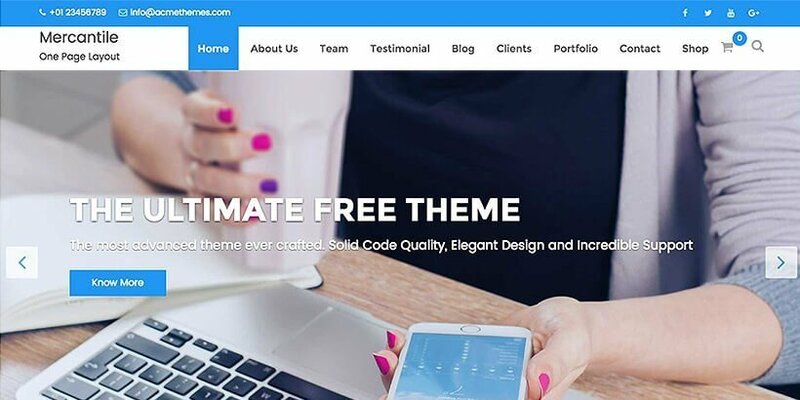 All of the themes in the list are highly popular and finest ones we have selectively picked them up from the best WordPress theme companies in the world. Travel Way is a mesmerizing and sleek travel WordPress themes. If you are looking to make a superb website on travels and make an impact then this is an ideal choice for you. Showcase all the services and unique offers of your travel company in an organized and professional manner. With the travel booking feature let your customers make advance bookings via online which will save lots of time. To talk about the look of the theme, you will simply swift way by the decent appearance of the theme and the well-structured layout design of the theme. You can see from its demo page the website can be divided into different sections where information can be displayed in a pleasant way. You can set the Testimonial page, Blogs, Team members, Image galleries, etc. Plus the easy customization of the theme makes it more comfortable to modify the theme and play with it. The theme is extremely responsive so let your website look amazing and perfect in any kind of screen size. Besides that, it is also SEO friendly so your site is assured to have a good ranking in google search. It also has good compatibility with almost all kinds of plugins. Mercantile is a sleek, modern and free WordPress theme which is based on blogs and portfolio. The layout of this theme has been crafted artistically with beautiful colors, graphics bug-free code to make it a flawless theme. It is also a multi-purpose theme so you can use it for business, corporate or any other purposes also. Though being a simple and one-page the theme it offers a huge range of exciting feature for its users. You can different widgets as you want, customize the theme design easily, change colors and much more. This theme is a good choice if you are looking to make a travel site or travel blogging site. Also, it has social media integration so you can share your beautiful website via social media like facebook, google+, twitter, etc. With this theme, you can showcase your blogs, stories, articles, etc. in an organized way or just simply build your portfolio site for a personal or professional purpose. All in all, an ideal choice of theme for blog and portfolio. Travel Gem as the name suggests a gem for the travel industry. Just a one single demo import and your splendid travel website will be ready. The full-width fascinating slider of the theme will instantly blow your mind and make you excited to set images of your own. The theme is totally cross-browser compatibility so it looks great on any kind of web browsers like Opera, Firefox, Chrome, Safari, and others. Coded magnificently with the latest HTML5 & CSS3, the theme looks fantastic and assures to have a strong structure. Having good compatibility with Contact Form 7 plugin, set a simple form to make connections with your customers. With just a single click of demo import, you can have a travel website ready just as its demo page. If you want your site to look a little different then you can do it with much ease and make some minimal changes such its sidebar layouts as the includes options for the sidebar. Traveler Blog Lite is a minimalist WordPress theme for travel and tour agencies. Not just for showcasing the services of a travel company but also can be used as a portfolio and blog page. Yes, the satin look of the theme looks perfect to display the blogs of your travel journey. Share your stories and experience in your blogs and let the world know about it. It’s a highly responsive theme so no need to worry thinking how your website will look in your smartphones and tablets. 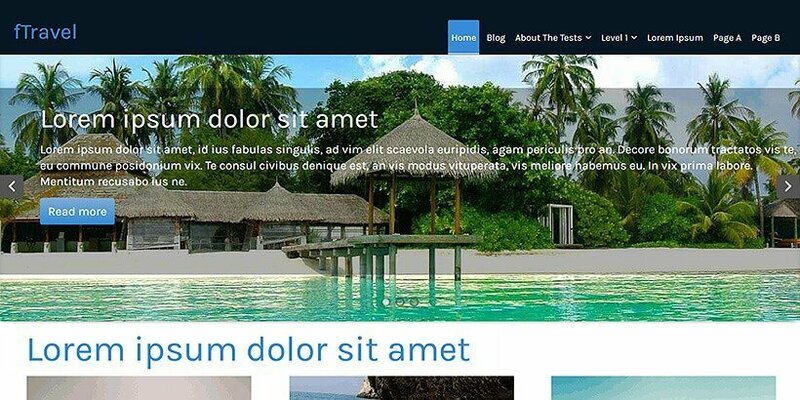 In case, if you want to have your site in another language then congratulation this theme is has a translation ready feature so you can make your site in any language you like. Again, it is suitable for travel agencies who want to promote their business and grow their potential customers. The beautiful slider in the theme looks amazing and you can update it with more images of your own enriching the overall look of the theme. 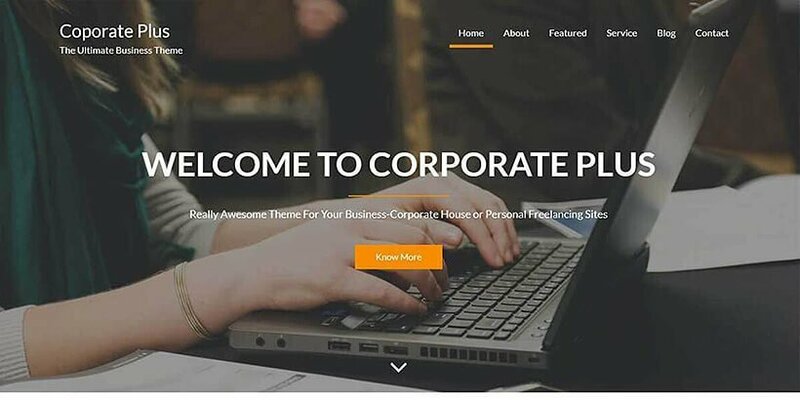 Corporate Plus is a supreme and sleek free WordPress business theme based on commerce and corporate field. As the demand for a professional business website is high, this theme will be an ideal one for every business owners. The simple appearance of the theme indeed forms a great way to showcase the services and other things in a sophisticated manner. Take your business to the next level with its awesome features. This theme is also a suitable one for a travel site since it is also a multipurpose theme. The theme is highly responsive hence your site will fit perfectly well in all kinds of smart devices such as mobiles and tablets and of all in different sizes. There is a wide range of unique widgets available in the theme which you can use and make you more flexible. Easy customization is also a great attraction to the theme. Travel Booking is a charismatic and clean free travel WordPress theme. The theme has vivacious look and appearance which will instantly grab the attention of its visitors and make them stay on your page for a longer period of time. It extremely speeds optimized and loads faster in every browser with the latest version. You will have a wide range of widgets to choose from to decorate and your site. 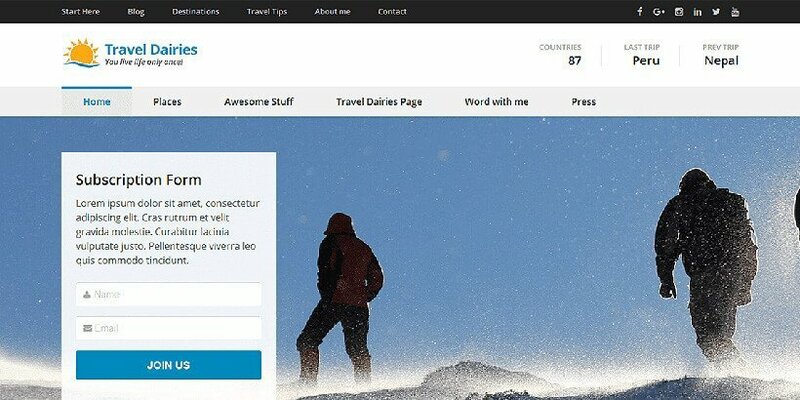 Travel Company is a breathtaking free WordPress theme for travel and tour companies. Since a website is the main face of a company choose the best one which will reflect your business completely. The classic and manifesting appearance of this theme will undeniably take your business to the next level. With the easy customization, you can change the overall look of the theme with less effort. You can highlight the important aspect of your company in the front using its feature page slider along with vivacious effects on the slider. Yes, the theme is responsive and it is assured to have your site view well in smartphones and other devices. Build trust with people and other companies by showcasing customer testimonials in your site. It is well documented which will give you superb guidance while working on your website. 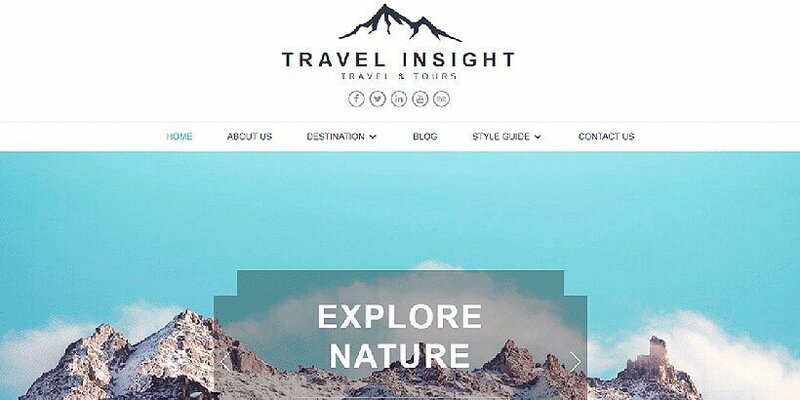 Travel Insight is simply a sleek and minimalist WordPress theme for travel company and blogs. The choice is yours whether you are an enthusiastic travel blogger who is always energetic to blog about your experience and stories, or own a travel office and looking forward to having a professional website. 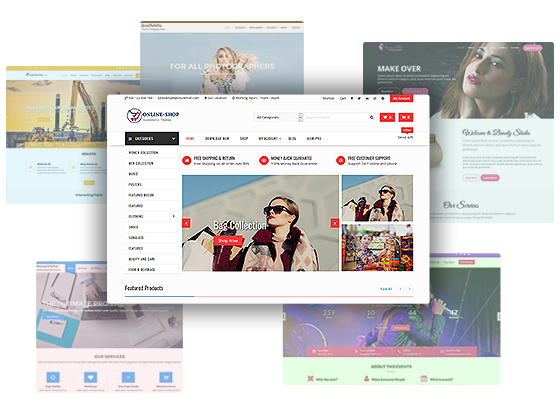 With this theme, the viewers of your website are going get drowned by seeing the beauty of its appearance. This theme is compatible with all kinds of browsers there in the market like Firefox, Chrome, Opera, Safari etc. If you are not happy with the general color scheme of the theme then you can simply go to its color option where you will find the color palette option and update it with new colors as you desire. Also, the translation ready feature will let you be able to have your website in different languages. Suppose, you want a various race of people from different parts of the world to visit your site. This simple and chic WordPress theme known as Travel Tour is set to be one of the best minimalist themes for travel. With its magnificent appearance, a complete and professional travel website will be ready in no time. It is extremely fast loading so every pages and link of your site will open rapidly with every click. You can add share your social media accounts like Facebook, Instagram, Twitter, LinkedIn etc. within the front page of your website. With its easy customization, people can do simple changes in the theme such as changing the logo, altering layout design, updating new colors in the font, font size, font style and font -family etc. The widgets available in the theme makes it a splendid one and let the user play more with the theme. The theme offers varieties of font option making users have uniqueness and flexibility in their website. 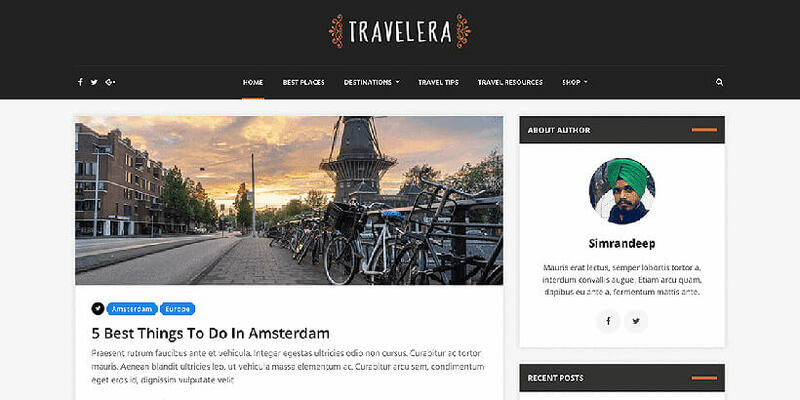 Travelera Lite is a wonderful and fascinating WordPress theme designed distinctly for a travel website. 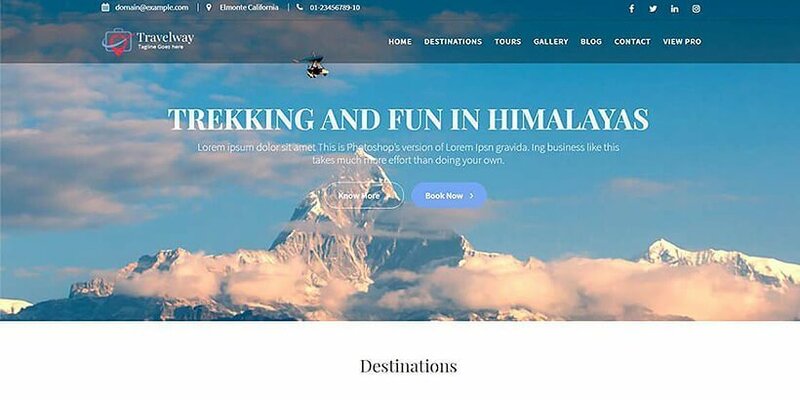 With its unique and appealing layout design, any travel & tour company can build an outstanding and professional online presence for their business. The theme has all the features which make it popular and an ideal choice. The theme has good compatibility with WooCommerce so you can open your online store on your website if you wish to have one. It has social media integration to let you connect your website with your various kinds of social accounts and lets them know what your site has to offer. The slider widget in the theme adds to the beauty of the website and make it more appealing. If you are a frequent travel blogger and want to share your experience and stories with others then you can instantly make a blog site with it. Luxury Travel is among the ideal choices among the best free WordPress travel themes. The theme is a flexible and beautiful WordPress theme. The minimalist design of the theme is perfect for any kind of restaurants, cafe and coffee shop etc. Besides travel companies, it can also be used as a theme for portfolio, news, fashion etc. Its stupendous features make this theme more interesting as people can play with it and do lots of stuff. You will able to work on your site and customize it as you wish with the help of the documentation provided. Share your social media accounts such as facebook, linkedin, twitter, Instagram etc in the top header of your website. Also, consisting of WooCommerce compatibility, users can enjoy the feature of displaying your services, unique offers, products etc. in an online store within the site. 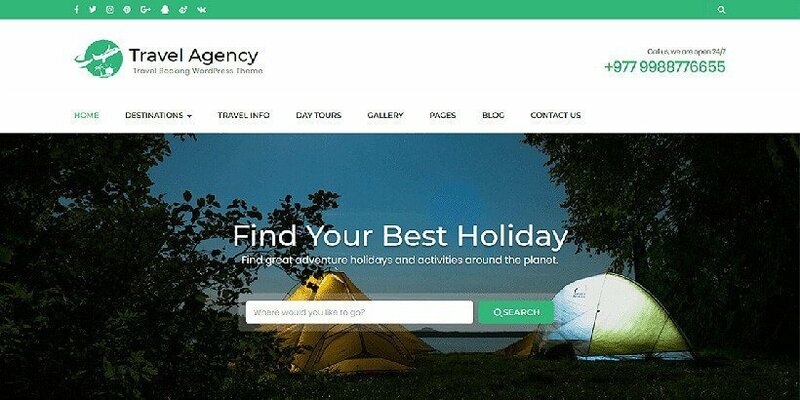 Travel Agency is a simple yet sophisticated travel WordPress theme. As the name suggests, it is entirely based on travel & tour agencies. The glorious and eye-catchy appearance of the theme will simply hold the attention of its viewers for a longer period of time. You just need to install the theme and import its demo content instantly. It has in-built live customizer through which you can make modification in your site while previewing the changes on the other side. If you own any kind of travel agency then this is definitely a suitable one for you to showcase your companies details. By the way, it is also a multipurpose theme and can be used for other purposes too such as fashion, art, blogs, fitness, etc. The theme is fully responsive and it is viewed well in any modern electronic devices such as smartphones and tablets. Moreover, it has very good cross-browser compatibility and runs well in any kind of web browsers like Firefox, Chrome, Opera, Safari, and others. If you are tired of searching for a simple travel WordPress theme for your site then ftravel is here for you. Yes, you can build up a freaking awesome site with ftravel. The built-in Live Customizer makes it easy for you to have some slight modification in your website. The theme is simple yet stylish and people are likely to get instantly attracted to your site. Showcase the services and special offers of your business widely and professionally. Consequently, taking your business to the next level. If you are a blogger then you can use it to develop a blogging site to display your blogs on travels journeys. It is a highly responsive theme so you can easily view your site in any modern devices such as smartphones and tablets. No doubts in the quality of its design as it has been constructed with the updated HTML5 & CSS3. The supreme appearance of the theme will make its visitors overwhelming and curious. In addition to that, astonishing features included in the theme will elongate the theme to be more flexible. Travel Eye is a majestic and sleek free WordPress theme for the travel industry and travel bloggers. 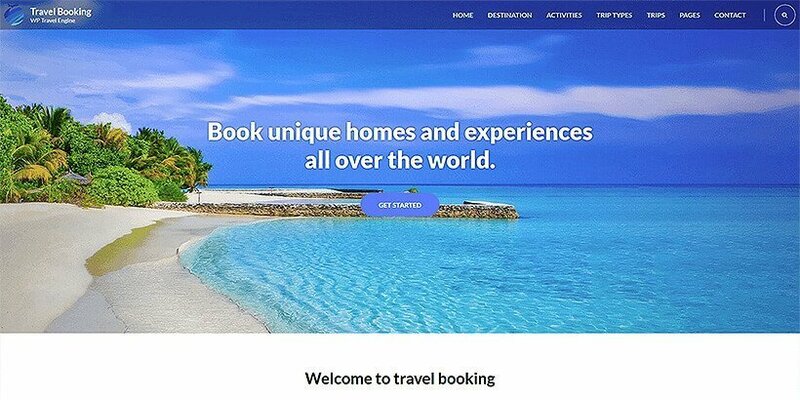 Get ready to build a complete and astonishing website for your travel company. You will not only have an amazing online presence of your company but also let people be aware of it and attract more and more customers. The awesome parallax option will simply make your site more appealing and captivating. It has good compatibility with all kinds of plugins so you can increase the functionalities of your website in your The theme is completely SEO friendly so it will create a positive result for your site in a google search. With just a single click of demo import, your site will be ready instantly. Even if you are a nontechnical person then you will have no problem in modifying the theme as its customization is done easily. As the name goes, Travel diaries is an excellent WordPress theme for a travel enthusiastic bloggers and a travel based company as well. The charismatic outlook of the theme will give your site a crisp and simple look. If you are running a travel agency or something like that then showcase your services and offers to people globally. For bloggers, of course, you can present all of your blogs in an organized way and let people know read it and know about your experience instantly. As the theme is highly responsive, users can view your site perfectly and flawlessly in any kind of hand-held devices such as smartphones and tablets. 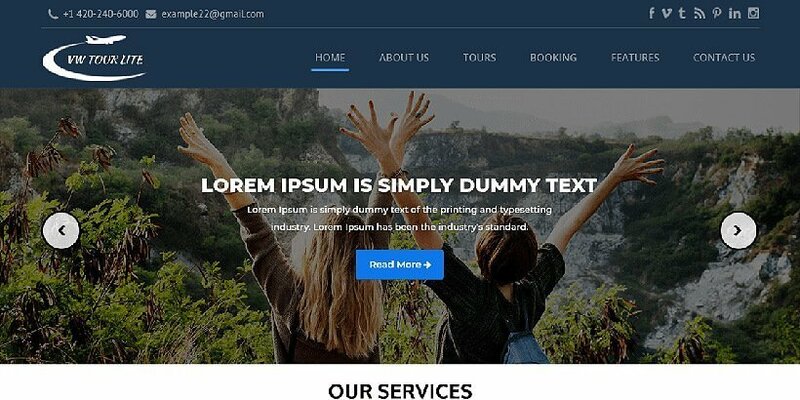 Once you check this theme and use it fully you will feel that you have made the right choice and this is the best one from the huge list of free WordPress travel themes. If you have any social accounts then you must want to add it in your site, then just a simple modification you can share all of your social related accounts like Facebook, Instagram, LinkedIn etc. Travelers is a sizzling and creative travel WordPress theme and can also be considered as one of the finest free WordPress travel themes. The unique appearance of the theme simply captures the attention of its viewers instantly. With this theme, you are assured to make a cool website with awesome features. The easy installations of the theme get everything so quick and accurate that will make you a happy user. Its constructed with the latest and HTML5 and CSS3 that makes sure your site is up to date with the trending technology and design in the market. It has compatibility with all kind of browsers such as Firefox, Google Chrome, Opera, Safari and many such. Your site will look good and exact in all of them. Besides that, it completely SEO friendly. Hence, people can easily find your company in a google search. This, as a result, will help a lot in the advancement of your travel company business. One of the unique features of the theme includes the astonishing animations appearing effects that will give your website an outstanding and modern look. ClubTravel is one WordPress theme that gives the look of freshness and excitement. Indeed its the suitable theme among the best free WordPress travel themes that will give your site a youthful look. The passionate and professional bloggers who want to share their journey and experiences in the WordPress platform then no need to look further. Display your daily journals and travel stories smoothly in a much presentable way. This lavish theme is immensely responsive. So, users can visit your site in smartphones and tablets with flawless design and perfect layout. You might want to give an interesting appearance to your websites like adding different kinds of widgets such as calendar, recent posts, image gallery, and many others. Well, you can do it with much much ease and intensity. It offers a broad number of exclusive widgets for you ta have some flexibility in your theme. 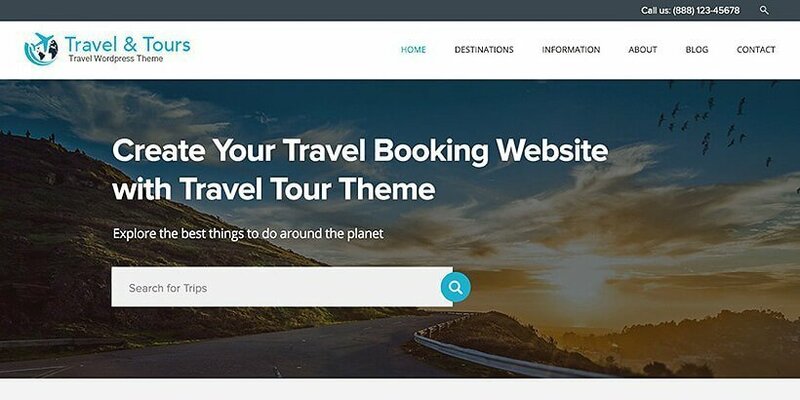 If you are looking for a modern and stylish WordPress theme for your travel company then VW Tour Lite is one that will end your search. The stirring and majestic look of the theme will promptly make the viewers of your website go gaga over your website. Your customers will hardly get tired of checking on your site and get them curious about what you have to offer. You can highlight the unique destination or special offer in the front page slider to attract your potential customers straightway. It has compatibility with any kind of browsers such as Firefox, Google Chrome, Opera, Safari etc. Besides that, it is completely SEO friendly. Hence, it is certain that your website is going to have a good ranking in google search. Since it supports a wide range of plugins, you can do many things in your website and advance its functionalities. There is a big number of plugins available in the market you can use any of your preferred one to enhance your website. 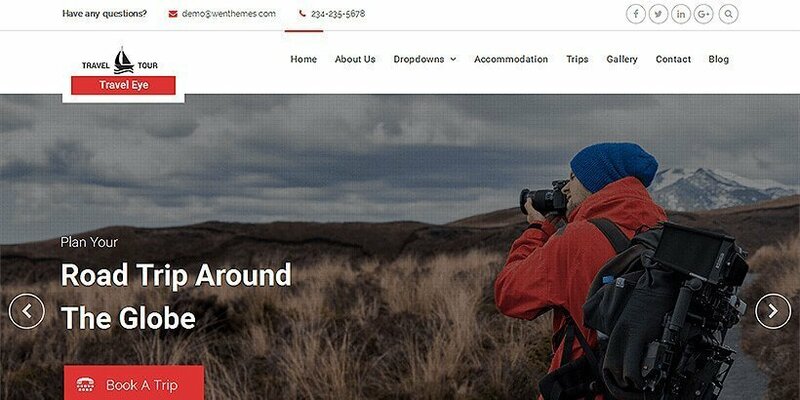 Well, those were our list of best free WordPress travel themes. We have personally handpicked them for all the travel agency owners. If you feel you found the right one for your travel site then you can choose your preferred one and get your awesome travel website ready. Did you find this article helpful? How about sharing it with us by writing in the comment section below?